I love Amy Butler's book Little Stitches for Little Ones. I've made these booties twice now for Lil C. The first time, he was just about 3 months old so they really just were a cover-up to help him stay warm. Now that he's moving about, it's another story! I got some non-slip fabric from my mother and used that as the sole. It really helps. C isn't walking on his own quite yet but he's close and good shoes help keep him steady. Wow, does he ever move fast when he walks! I do need some support with these booties though. If anyone has made them already and they actually fit your wee one, let me know. 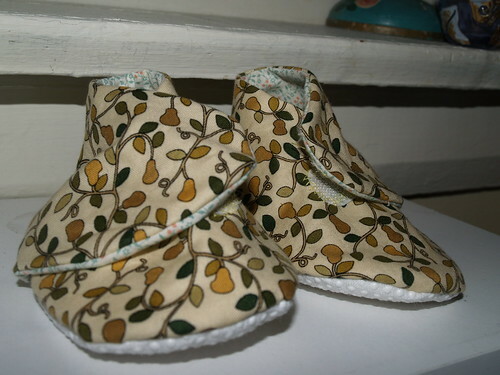 My partner, J believes these booties must have been made for babies with 'club' feet as they're so wide. I made the 9-12 month old size and C is 9 months now. I just can't see him growing into them that well. The other problem is where the velcro is placed to close them. Looks perfect without a foot in them, and i'm sure i followed the instructions/pattern to a T. But, i just can't close them securely once his foot is in. I'm thinking of getting rid of the velcro and adding some sort of snap or at least moving the velcro to a better spot. They're just too cut to have as display only! Too bad they don't fit quite right because they sure are cute! Those booties match his lambkin softie! Maybe you can make the flap longer?